The name of the town derives from the rural huts made with tree branches (It. frasca) built by the inhabitants of Tuscolo, when their town was destroyed by the Romans in 1191. The small hamlet became a rich town in the second half of the XVIth century when the Altemps, soon followed by other Roman families selected this location to build their villas. In 1620 there were already 14 villas belonging to the richest families who spent their villeggiatura (staying at a villa) in Frascati. At the end of the XVIIth century pope Innocentius XII promoted the erection of a large cathedral which was completed in time for the Holy Year 1700 (the bell towers are a later addition). It is interesting to note the use of a local volcanic stone (pietra sperone) associated with travertine: a contrast which can be seen in other churches of the Castelli (e. g. the Cathedral of Albano) and to a larger extent in many churches of Naples. The church and the monumental fountain at its right side were both designed by Girolamo Fontana, nephew of Carlo Fontana, the most important Roman architect at the end of the XVIIth century. The Jesuits too had an imposing church which shows the importance of Frascati from a "political" viewpoint. The interior is richly decorated in line with the Jesuits' view on the appropriateness of the use of paintings and decorations. Chiesa del Gesù has two impressive examples of the skills developed in the study of perspective laws (other examples can be seen in a page on Baroque Ceilings). 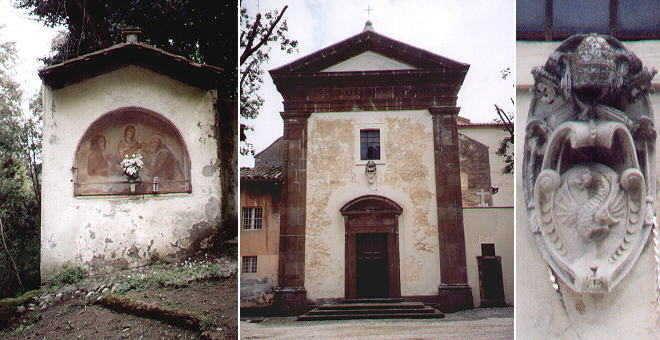 The Franciscan church of Frascati offers a striking contrast with that of the Jesuits. 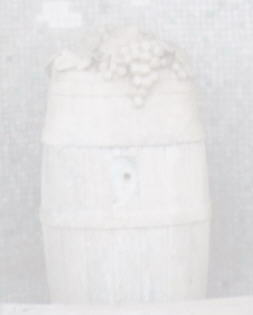 It is located outside Frascati, still in a rural setting. The only embellishment of its simple façade is a coat of arms of pope Gregorius XIII. The fortifications of Frascati are relatively minor: the most notable evidence of their existence is a small fortress (now the bishop's palace) controlling the access to the town from the plain. Next to it there is the only monument belonging to the Middle Ages, the bell tower of S. Rocco dating back to the year 1305. 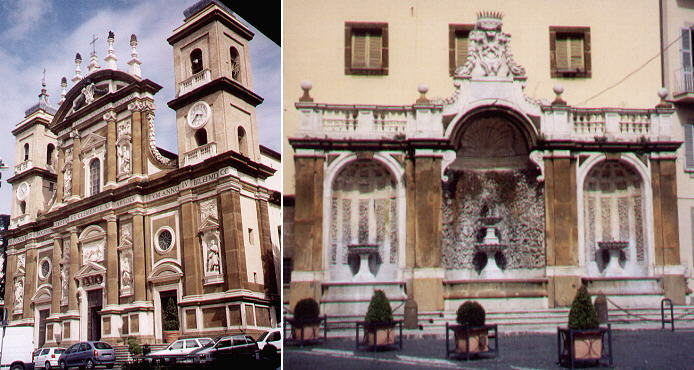 A small fountain with three pots on top of a column is due to the intervention of pope Innocentius XII (a similar monument can be seen at the foot of Campidoglio in Rome). Although pope Urbanus VIII choose Castelgandolfo as his summer residence, the town hall of Frascati has a very intriguing coat of arms of that pope, with a strange face showing up below the papal symbols and another one appearing at the bottom of the shield (for more intriguing coats of arms of Urbanus VIII in St. Peter's click here). In addition to coats of arms of the most important Roman families, Frascati has also coats of arms of the Stuarts, in particular of Henry Stuart born in Rome in 1725, created Duke of York by his father James and created Cardinal of York by pope Benedictus XIV. He spent most of his life in Frascati with the title of Bishop of Tusculum. At the death of his brother Charles Eduard, initially buried in the cathedral of Frascati, Henry declared himself Henry the Ninth of Great Britain, France and Ireland, King, Defender of the Faith, Cardinal, Bishop of Tusculum. His coat of arms in Frascati shows both the royal crown and the cardinal's hat (for another coat of arms of Henry Stuart click here). Read William Dean Howells' account of his visit to Frascati in 1908. Tusculo antico oggi Frascati città Dodici miglia lungi da Roma, camminando per la strada fuori della porta s. Giovanni, fu quell'insigne città, fabbricata sull'eminente collina da Telegone figliuolo di Ulisse e di Circe per collocarvi la sua regia. Prese un tal nome forse da' Toscani, che l'ingrandirono, o da Greci, che ve lo imposero per la difficoltà del salirvi; e fu di tal maniera forte, che in essa ricoverossi Tarquinio Superbo ultimo Re discacciato, da' Romani; donde nacque poi la fierissima guerra tra' Latini, e i Romani, e non cessò fin a tanto, che quella città non rimanesse spianata fino al suolo con tutte le sue magnificenze. Non per questo fu dipoi abbandonata, anzi più gloriosa risorse per opera de' medesimi Romani, i quali la illustrarono con magnificenze più insigni, vedendosi in quell'angolo del colle verso tramontana le diroccate mura; ed il famoso Tusculo di M. Cicerone, in cui aveva aperta per suo trattenimento letterario una accademia, che fu la più fiorita di tutta l'Europa, concorrendovi tutti i maggiori letterati di Roma e del Mondo ancora: onde Tusculane si dissero quelle questioni e quesiti, che in un picciolo, ma prezioso volume si gode, formato in quelle delizie dal Principe della Romana eloquenza. In quell'altra parte del colle verso Oriente fu la famosa villa di Lucullo, e dove si vedano sparse a mucchi le pietre su il vecchio sepolcro de' Furj, e la regia di Tarquinio suddetto.